You belong in a zoo! Can't say I've ever had that actually yelled at me, but I do enjoy going to the zoo (though it's been quite a long time since I've been to one). As one would expect, I tend to head to the polar bear enclosure and hang out there. If I could build my own zoo, it'd be all polar bears, all the time! What would you put in your zoo? That's what you get to answer in Zoomaka, a new card game that's up on Kickstarter now. Zoomaka is now live on Kickstarter. In Zoomaka players take turns to build on their zoos. The first to build four park sections win the game. 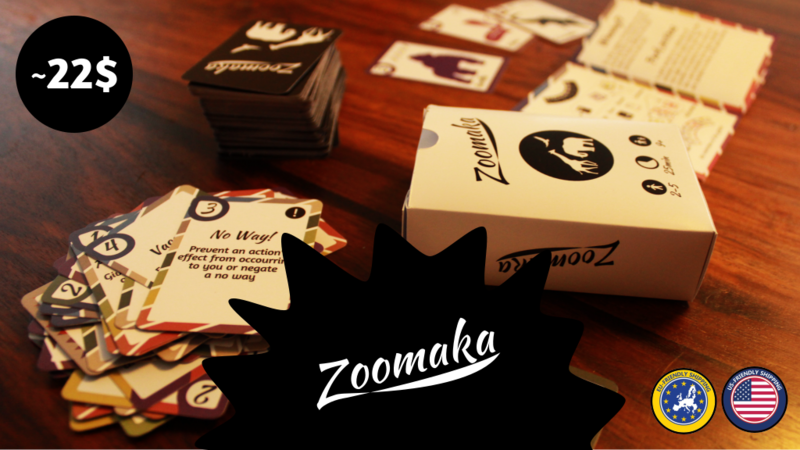 Zoomaka's action and response cards give the game a strong Take that! feeling making it ideal as filler game. The campaign's about 1/5 of the way to its goal with still 30 days on the clock.